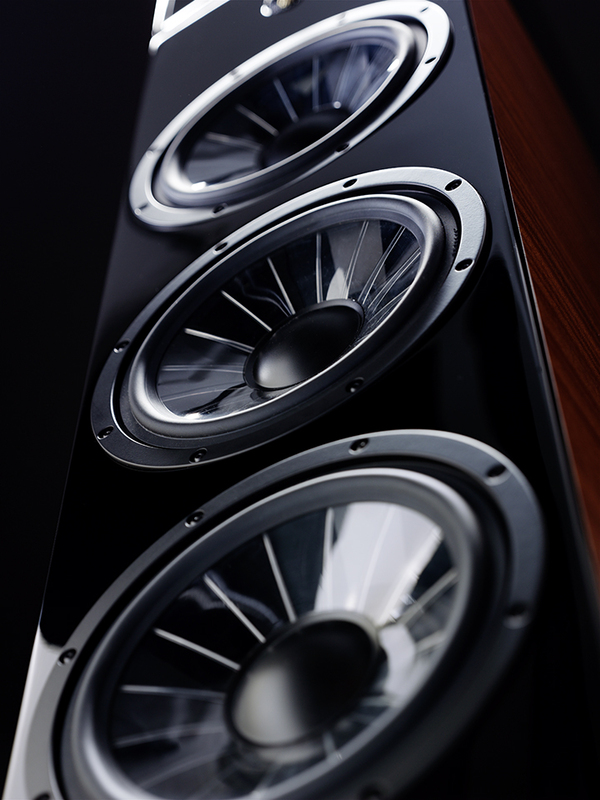 Long an advocate of concentric drivers, Vienna designer Peter Gansterer again set out to eliminate the fundamental weaknesses in the concept and tailor it to his speaker designs. The key lay in an adaptation of the XPP material and Spider cone technology, but using a lighter, stiffer blend of thermoplastics reinforced with glass fibres that allowed the creation of a substantially buttressed, flat diaphragm, with superb self-damping and that still provided an impressive stiffness to weight ratio. The resulting 18cm flat driver array, with its complex and carefully tuned web of radial and concentric ribs, promises superior integration across the mid and treble, while eliminating phase and colouration issues associated with relative movement between the tweeter and the shallow horn (the midrange cone) loading it. Of course, having achieved a time and phase coherent output from around 100Hz upwards, it made sense to allow precise adjustment of driver angle and attitude – hence the creation of what Vienna refers to as the Music Center. This box within a box arrangement doesn’t just allow the head unit to be rotated and tilted independently of the bass cabinet, it provides graduated, micrometer-style mechanisms to make those movements both independent of each other and repeatable. At the same time, Vienna, realising that the attitude and placement of the bass cabinets in the room was every bit as important to the overall performance and integration of the system, engineered a set of elegant outriggers and conical feet that are easily adjustable from above, allowing users to independently adjust both the rake angle and height of the bass enclosures, balancing the low frequency output against the bass nodes in the room, and opening or closing the angle between the bass and midrange baffles to optimise system integration and match set up to the height and distance of the listening seat. It’s something that will be familiar to any Wilson WATT/Puppy owner, a proven approach that has reached its apogee in the current Sasha 2, but none of the Wilsons manage a solution as elegant or as easily implemented as The Music. Finally, three small dip-switches on the terminal plate allow users to apply subtle lift to any or all of the low, mid, or upper bass output, allowing you to contour the speaker’s bottom to compensate for broad room characteristics. Being that adjustable, it should come as no surprise that The Music really rewards care and attention to set up. Toe-in and rake angle of the head units is predictably critical – but fortunately easy to adjust. What I wasn’t ready for was just how critical cabinet height proved to be in dialling in and voicing the bass. Set up would normally be the responsibility of the dealer, meaning owners don’t need to get their hands dirty or understand what is a convoluted and exacting process. But it is worth looking at what’s involved, simply because it goes a long way towards explaining what makes The Music different to the vast majority of its competition and just why it delivers such stellar musical performance. Starting with the cabinet level – and with the dip-switches set on zero – the speaker must be positioned for optimum bass performance, starting by ‘walking’ it forwards and backwards, side to side, working on a number of ‘best’ positions, marking each and carrying on until it hits the one that really works. Next, toe-in, rake angle, and finally cabinet height all need to be adjusted. Then it’s on to the head units and more step-by-step adjustments. This means working in ever-smaller increments and on each head individually (experience suggests that they probably won’t end up absolutely symmetrical), but the closer integration gets to perfect, the bigger the differences to presence and dimensionality even tiny changes make. This whole process is best carried out with a pair of helping hands and it’s a lot easier if you have some experience of The Music, but it is totally systematic so you can work through it even if you’ve never seen the speaker before. You’ll be amazed at the way this process allows you to tune the bass for weight, scale, and pace... and match it to the overall presentation of the speaker. You want monstrous scale and thunderous power? The Music will deliver it. You want a lighter, more agile response? It will deliver that too. What is never in doubt is the overall sense of coherence and the musical communication that results.